Senator Marco Rubio (R-Fla.) has proposed an amendment that would require immigrants to pass a level-3 English proficiency test in order to receive a green card for permanent residency in the United States. This is the same test currently required for immigrants to become naturalized citizens, but this amendment would make aspiring citizens take the test much earlier in the path to citizenship. The amendment would cancel out a current provision in the Gang of 8 bill that would require only proof of enrollment in English classes or tutoring to become a permanent resident. While the amendment may not sound very offensive, the fact of the matter is that it will only hurt immigrants on the path to citizenship. regardless of the number of times they can make it to class, regardless of their job, regardless of their age, regardless of where they are from, the one thing that none of them lacked was a strong desire to learn English. This is where Senator Rubio and I agree: English is important for immigrants to gain a high standard of living in the United States. However, as it is, there is an influx of people needing English language education and not enough teachers and programs to meet those needs. In addition, the classes cost money, for which many immigrants simply cannot afford to pay. Certain programs that are run by charitable organizations, like where I worked, can keep prices low at only $10 a semester. But because these classes are scarce, immigrants would have to turn to resources like private tutoring, which run $10 an hour on average. Moreover, it can take years of extensive practice time for adults to learn a new language, time which many immigrants simply do not have. I say again, immigrants learning English is not a bad thing. But, unlike countries before us who have enacted similar initiatives, including the U.K. and Australia, we do not have the infrastructure, the ESL standards, or, most importantly, the funds that we need (approximately $11.5 billion) in order to implement this amendment practically and equitably. This amendment would unfairly bar less skilled, less educated and lower class workers from obtaining green cards even though they have built the foundation of many American industries for years. 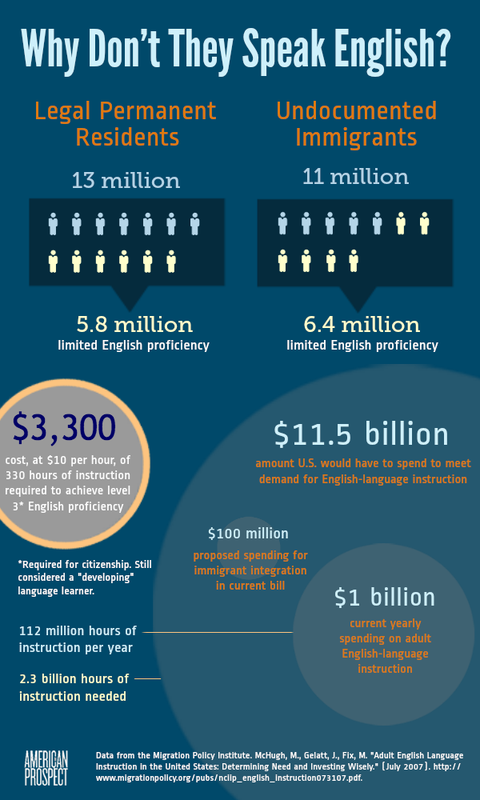 Arguably, these are the very immigrants that could benefit most from English language learning programs, but for many they remain unavailable. This is not the way to promote cultural assimilation and economic success; this is yet another roadblock that would discriminate against immigrants on the pathway to citizenship. FIRM Calls Corker-Hoeven Amendment to Senate Immigration Reform Bill a "One-sided Travesty for Border Communities"